For the tobacco fanatic and deal hunter in you. This bulk pack has enough tobacco to satisfy even the most frequent smoker. Combine that with an unbeatable price and you have yourself a pretty great deal. 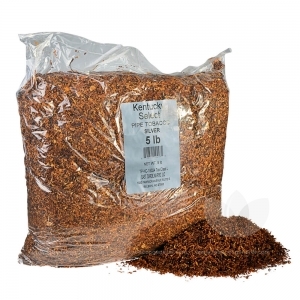 The easiest smoking version of the Kentucky Select. The silver has the smoothest flavor and virtually no harsh after taste. A great blend for a casual smoker, or just one that prefers an easier, more relaxing experince. Each bag is created using a unique processing method to bring out the all natural flavors of the tobaccos and deliver an uncompromised smoke. I continue to buy this brand. It is light and mild. I have always smoked light cigarettes, this tobacco compliments RYO cigarettes by providing the light taste I desire. I'll continue to order this brand.